The 35th Infantry Regiment Association salutes our fallen brother, SP4 Lawrence Russell Dance, who died in the service of his country on May 15th, 1971 in Thua Thien Province, Vietnam. The cause of death was listed as Booby Trap (Then with 101st). At the time of his death Lawrence was 24 years of age. He was from Chester, Virginia. The decorations earned by SP4 Lawrence Russell Dance include: the Combat Infantryman Badge, the Bronze Star, the Purple Heart, the National Defense Service Medal, the Vietnam Service Medal, the Vietnam Campaign Medal and the Vietnam Cross of Gallantry with Palm Unit Citation. Lawrence was with B,2/35th but when the 4th Division went home November/December 1970, he was transferred to Company D, 3/187th, 101st Abn Div. 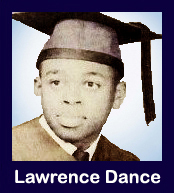 Lawrence (Jim) Dance was an outstanding student and friend at Virginia State University. He graduated with honors with two degrees from VSU. Most of all he was the friend of Nu Phi Nu (Newport News Homeboys) and we, the following will always remember him: Wayne Perkins, Boyd O. Moody, Wayne "Q." Williams, Robert White, Linwood "Bama" Cobsy, Charles "Winston Salem" Jefferies, James "Juney" Ricks and James "JAW" Wheeler. Lawrence was our friend that served his country, even when our country was not serving( "rights") him. He taught all of us humilty, order (HU) truth (MAAT) and true love of our HISTORY in the universe (KA). We will never forget his presence on Earth. As stated (thesis) by Chiekh Anta Diop in - The African Origin of Civilization - " The history of Africa will remain suspended in air and cannot be written correctly until African historians connect it with the history of Egypt." Lawrence Dance - " We love you and treasure your life ... live on forever." Through his untiring efforts and professional ability, Specialist Four Dance consistently obtained outstanding results. He was quick to grasp the implications of new problems with which he faced as a result of the ever-changing situations inherent in a counterinsurgency operation and to find ways and means to solve those problems. The energetic application of his extensive knowledge has materially contributed to the efforts of the United States mission to the Republic of Vietnam to assist that country in ridding itself of the communist threat to its freedom. Specialist Four Dance's initiative, zeal, sound judgment, and devotion to duty have been in the highest traditions of the military service and reflect great credit upon himself, his unit, and the United States Army. member, 3rd, platoon, Co., D, 3/187. Larry was killed, on Mother's Day. I think, of Larry and his family, each Mother's day and pray, that they have, comfort, in knowing, that he was, such a good, young man and well, thought of, by fellow, platoon members.